H and H Tree Service removes all sizes and quantities of trees. H and H works in both front and back yards using ladders, ropes and saddles. 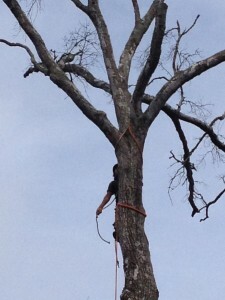 The experienced tree removal experts use rope to move tree branches and logs away from any obstacles on the ground. The professionals at H and H Tree Service are the best in close quarter tree removal. All debris is hauled away and all cleanup is done by air blowers and rakes.